Former president Bill Clinton reflected on the late George H.W. Bush's life in a Washington Post op-ed, in which he wrote the note Bush left him on his way out of the Oval Office revealed "the heart" of who he was as president. Why it matters: Former presidents Bill Clinton and George H.W. Bush were political adversaries with different ideologies and varying party affiliations. But in Bush's passing, Clinton detailed the person he truly believed him to be despite their disagreements. Details: Clinton revealed the contents of the letter highlighting how Bush offered encouragement and solace to him as he embarked on his first term as president in 1993. 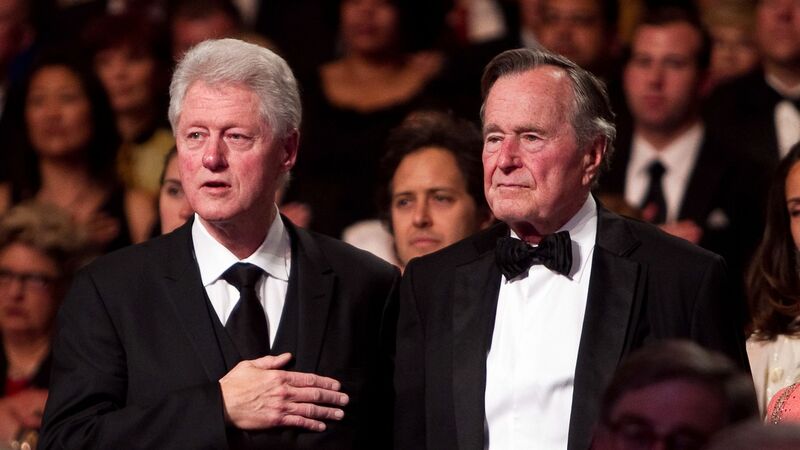 Bush told Clinton that, despite warnings of the presidency and the White House being lonely, "I never felt the loneliness some Presidents have described." He also wrote about the "tough times" Clinton would face and how to deal with it: "I'm not a very good one to give advice; but just don’t let the critics discourage you or push you off course," he said. After his presidency, Clinton said the relationship between the two grew. He called their friendship one of "the great gifts of my life... I cherished every opportunity I had to learn and laugh with him. I just loved him." The big picture: Clinton said he always admired Bush, not because of their relationship but because "people came before politics, patriotism before partisanship." And though America seems to be increasingly partisan, Clinton said Bush would believe "it's your duty to get that America back."